The PEG-SJ20 is Sony's latest entry-level model, coming in at $200. It is a jump up from the newly released, and less expensive, SL10, with more memory, an internal battery, and a better backlight. I've only had an SJ20 since Wednesday so I don't feel ready to do a full review. However, I'll cover some of the points that people have been asking about now that Sony will let me talk about it. When I first heard Sony was releasing another hi-res monochrome model, my first thought was "I hope it's better than the T415." I didn't enjoy it but I was one of the people who had to pan the T415 for having a screen that was just too dark. In my review, I suggested to Sony that what the T415 needed was a white backlight, not a green one, and to have the backlight be on by default. I don't know if someone was listening or not but that is exactly what the SJ20 has, and it has saved the model. However, the screen isn't perfect. Like the SL10, it suffers from "ghosting". This means that moving items on the screen leave a trail behind them. While this won't affect most applications much, it does cause real problems for fast-moving games. You can definitely play Kinoma movies, though some moving things do get blurred. For eBook reading, this ghosting will also limit how fast you can have the text scroll before it becomes unreadable. I tried it and found text was OK as long as it moved at a slow to moderate pace. Anything you might describe as even sort of fast was unusable. Nevertheless, the good contrast and bright screen make me think the SJ20 would make a good eBook reader for most. Just use the Jog Dial to change pages. Like I said, the backlight saved this model. Without it on, the screen is too dark in all but the brightest lighting conditions so expect to have it on pretty much all the time. You can, however, use the SJ20 in direct sunlight without problems. The shape for the SJ20 has turned out to be a bit controversial. It is significantly shorter than previous Sony models but it is also thicker. If you want to be exact, it is 4.1 by 2.9 by .7 inches. It weighs 4.5 ounces. I think this general shape came about because of the SL10, the SJ20's sister model. It uses AAAs, which limits how thin it can be. I'm guessing someone at Sony made a decision that all these models would be the exact same size. This has advantages both for Sony and for us end users. Sony gets interchangeable parts between all three models, which can really cut down on production costs. We get some of this savings passed down to us, plus cases designed for any of these models will fit all of them. This is a real advantage. 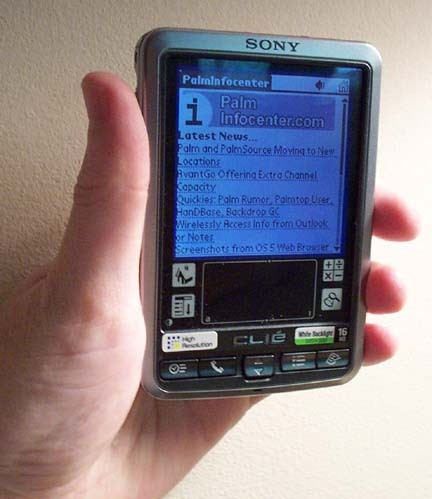 For example, Palm made the m500 thinner than the m505, which seemed like a good idea at the time. Have fun finding a hardcase that fits the m500 well. They are all designed for the thicker m505, leaving the m500 to rattle around inside. As you can probably tell, I've got no problem with the slightly thicker casing, for the same reason that I don't object to the shape of Palm's m100 series. What fits best in your pocket isn't what fits best in your hand. In your pocket, the thinner the better. In your hand, a bit of thickness makes a handheld more comfortable to hold. And it isn't like the SJ20 is huge. The thickest part of the SJ20 is .1 inch larger than the thickest part of the T665C. This is usually one of the major areas of my reviews but I haven't had the SJ20 long enough to be able to tell you anything very useful. So far, though, it looks pretty good. At this point I've been using the SJ20 for 4 hours and 30 minutes since the last recharge and the battery is at 50%, even with the backlight on the whole time. Battery levels don't drop consistently so don't read too much into that but I'm hoping for 7 or 8 hours of use before I have to recharge it. Monochrome models generally have much better battery lives than ones with color screens and I doubt this one will be any different. Long battery life, and lower prices, are the compensations for passing on a color screen. I'm not going into it in depth here but I thought I should at least mention that the SJ20 runs Palm OS 4.1 on a 33 MHz Dragonball chip. It has 16 MB of RAM, which is as much as you can have. It has a Jog Dial and, in an improvement over the S360, a Back button, which makes the Jog Dial much more useful. The SJ20 has the same HotSync port the T- and NR-series models do. There are some differences about the shape of the bottom of these various models so I'm not going to say that all peripherals will work with all models but things look promising right now. I've tested the SJ20 with various cables designed for the T series and haven't run into any that won't work yet. This is important because the SJ20 doesn't come with a cradle, just Power and HotSync cables. If you want a cradle, you'll need to buy one from another Sony model. The Memory Stick slot seems unusually slow. I haven't had a chance to explore this in depth yet but I promise I will in the full review. Usually reviews focus on the features that are included in a handheld, but I think its necessary to go over some features that the SJ20 doesn't have. It does not have the enhanced speaker from the T and NR series. It has the standard "beep-beep-beep" one most Palm OS models do. It also doesn't have the enhanced infrared port first seen on the T series, nor does it come with the Clié Remote Commander application. This means you won't be using this as a TV remote unless you buy a third-party app for it. These aren't complaints; I understand this is a low-end model and some features have to be left out to keep the price down. But people keep asking whether these features are included and I want to be sure people know they aren't. Speaking of not complaining, it also doesn't have the godawful buttons from the T series. I won't be sad when we see the last of those. The ones on the SJ20 are slightly concave, plastic, and are fine for gaming or just launching applications. When Sony announced the SL10 and said it would be replacing the S360, I was a bit nervous because it didn't seem like a step in the right direction to me. The SL10's 8 MB of RAM and dark screen made it suitable for entry level users but not people who wanted something more towards the midrange. Sony seemed to be ignoring the people who are looking for a fairly loaded handheld but don't want to take the price and power hits that come with a color screen. That's why I was so glad when info about the SJ20 first began to leak out. And I'm even happier now that I've had a chance to play with it. Am I going mad or is that screen colour? Ooh the first to comment - there's a thing. The SJ20's screen has a purple frame around it a few pixels wide that is lit up by the backlight. I don't know if this is an accident or a brilliant bit of design but that purple keeps making me think the screen is actually color (or even colour). I promise you though, it isn't. What happens with the specification? Take a look at the web page (from Sony AU) for the real spec. > What happens with the specification? Hey Ed, it says on there Enhanced IrDA. You said in the review thinger that it does not have this like the T series. It says "USB (cable), Infrared, Memory Stick media slot", and nothing about the infrared port being enhanced. Trust me, I've got the thing right here in my hands. No remote control. Sorry. OK Thanks Ed. I'm even more excited now that I know it has Memory Stick Export. And BTW, how do you get these devices before they are released? I thought that the SL10 had 8MB of RAM, not 2MB? Gar!! Sorry, I got the SL10 mixed up with Palm's rumored low-end handheld. Thanks for catching me and I've updated the review. RE: SL10 w/only 2MB RAM? So why does this site say 4MB?? First off, that page is about the SJ20, not the SL10. In any case, neither model has 4 MB of RAM, but the page is kind of poorly worded so that I can see how you could be confused. So the SJ20 has 16 MB of RAM and 4 MB of ROM. Do you know if e-books and Wordsmith files can be accessed and read directly from the memory stick or must the programs and files be moved into memory first? Also, do you know if when hotsynching, files can be synched directly from/to the memory stick for later use? If the programs and files can access directly from the memory stick then Sony will have really filled a great sleeping gap: True large expansion with the complete portability of AAA batteries. No complaints anyway, it looks like the first rate value (coming from a die-hard Handspring Visor user). They had included the enhanced sound. I use enhanced alarms every day. I don't think that I would trade my T415 w/enhanced sound for a SJ20 w/o enhance sound. I can live without the remote control, but not without the sound. Altough that white backlight, and 16MB of RAM sure is tempting. Ed, do you think that the white backlight really makes the SJ20 that much more usable than the T415? > usable than the T415? Absolutely. It is the difference between being almost unusable and being just fine. Do these Sony models have a flip back cover. Yes. It is black and has the Clié logo on it. I'll put a picture of it in the final review. Does it come in other faceplates or other covers? Maybe I'll have one made with a custom logo. It just comes with the flip cover, like this image at http://www.sonystyle.com/intershoproot/eCS/Store/en/imagesProducts/MoreImages/PEGSJ20_5.jpg and no other form of a case. Saying that you need to have the backlight on all the time for a monochrome PDA is a huge step backwards. We've had monochrome PDAs for years that are perfectly readable without a backlight in most lighting conditions. I am floored that people actually think this is acceptable. It must be the same people that go to a store and buy the brightest TV instead of the one that provides the best picture. I disagree. Most monochrome PDAs are NOT "perfectly readable" without a backlight. The difference between my Palm IIIe and my Sony S320, with it's backlight on, is remarkable. The difference between my S320, with it's backlight on, and my color T615 is even more remarkable. In fact, I would never go back to a monochrome, not so much because I'm dazzled by the colors, but because the color unit is so much brighter. I had a IIIx and now a Treo 180, and both are perfectly readable with no backlight. Inside, outside (try that with a normal color screen), it's a joy. I concur with the first poster. I've had monochrome and color units. Monochrome is just fine without backlight. Colour is next to useless without backlight. Different people find different displays unreadable. The youth market will need a higher-refresh-rate display for gaming, and mp3; maybe a cost reduced t665-like model is in the works? > display and the option for thicker fonts, just what the SJ20 looks to have. If the SJ20's screen is anything like the T415, I highly doubt it is either super-bright or high-contrast. Before adding a comment to a review, it is helpful to read the review. ED said: "The strong white backlight gives it good contrast and a fairly white background. In fact, it is brighter and has better contrast than a Palm m505"
Well, I guess I'll throw my 1.5 cents in. For the sake of background, I've owned or worked on: IIIe, IIIxe, IIIc, M105, M500, T415, T615, M505, Samsung Smartphone, Visor, Visor Deluxe, Visor Edge, and M515. For most uses, the mono screens gave good visibility is daylight or office lighting, with the III series, Visor, and M500 being the most "open" and easy to read. The difficulty for mono arises when in low light conditions; not bright enough to see clearly, not dark enough to use the backlight. For color, it depends entirely on which type of technology is used. The devices like the IIIc and the Samsung were good everywhere except sunlight. The current Sony color devices, the M515, iPaq, and similar devices are good everywhere including direct sunlight (even though the iPaq has the wrong subpixel orientation). However, one of these color devices with the sidelights turned off will not appear quite as "open" as an m500. This is because the screen is below the digitizer and the light distribution lens, and there is often a space betwen the lens and the actual lcd surface. On mono units, there is no lens or gap, so the display is right below the digitizer and glass. For me, I'm in the half-light conditions too frequently, and also must use color highlighted spreadsheets. For the rest of the family (except the wife), it's mono. I own an SJ20. I can give you the info. If it's outside, in sunlight where most color screens explode, the backlight makes no difference. Inside, if it's dim at all, the backlight looks great. It's not as though it uses very much power, I can make it last a month on one charge with school level use, bacxklight on. I love the SJ20, don't trash it. Don't be annonamous. These models will sell like hotcakes, especially a half year or 8 months down the road when this particular unit is going for $150 or less. I'm especially amped about the color unit. The day that thing sells at $200 (probably half a year to 8 months later), PocketPC better watch out. Joe Six Pack will gobble this up. We don't CARE what models the "average folk" buy.....we merely care that it has the Palm OS. More penetration, more developer interest, more available products, more choices. They don't put cup holders in automobiles because people tend to drive while eating a hamburger. The more the Palm OS penetrates the market, the more useful our devices will be, long term, of course. We win. We win. We win. In other words, after Sony discontinues them. No, these models were intended to be sold at low prices. Nothing but positives will come from these releases. I'm not disagreeing that they were meant to be sold at low prices. Just making sure you're clear that 6 to 8 months from now, they will be discontinued. "I'm not disagreeing that they were meant to be sold at low prices. Just making sure you're clear that 6 to 8 months from now, they will be discontinued." You see this guy has this geeky/nerd circle of friends and whoever has the newest and top of the line pda usually gets the most attention. He just wants to be the it-geek in the group. try to understand him please? The original poster was claiming how great these things are going to sell when the prices are lower 6-8 months from now. Even better that "PocketPC had better watch out" and "Joe Six Pack will gobble this up". In reality 6-8 months from now, the prices will be lower because these devices will be on closeout. Selling the few remaining devices on closeout does nothing for marketshare. These will absolutely NOT be on closeout 6-8 months from now. You guys are smoking something. I can already get a Toshiba e310 for 289.00 new. How much will it retail for in 6-8 mos? I don't think PPC is in trouble in the low end color market. I do think Palm OS is in trouble unless os 5 devices are available soon. "These will absolutely NOT be on closeout 6-8 months from now. You guys are smoking something"
sony discontinues its clies every few months or so. these things will be history in 8 months. expecially after OS 5 is released. how many handhelds have sony released this year alone? SEVEN! T415, T615, NR70 NR70v, T665, Sl10, SJ20. and the SJ30 will be number EIGHT! the T415 was introduced in Nov. 2001. People stopped buying it in October. Just because a PDA has been replaced doesn't mean it's been discontinued. Just because it's discontinued doesn't mean it won't be made more. Just because it is stopped being made does't mean there won't be even leaft. People will always sell them on eBay. You are all being so anonamous and phsycho and hatful to Sony...!